The Teaching Station is the standard UofT electronic podium for large classrooms. 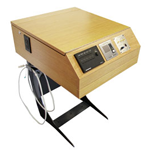 You use it to project your presentation from the ceiling-mounted digital projector. The TS has a touch-screen and built-in computer, but can also connect to your laptop or other audio/video device. The TSJr (Teaching Station Jr) is a smaller platform for medium-sized rooms (30-70 persons). It is fixed against the wall and has no computer - you hook up your own laptop. Is the Teaching Station or TSJr included in your classroom? If a Teaching Station / TSJr is built-into your classroom, there is no need to book additional equipment through Media Services at Education Commons. The SMART™board is a "touch-sensitive display that connects to your computer and digital projector to show your computer image. You can then control computer applications directly from the display, write notes in digital ink and save your work to share later. Technical Requirements: the Education Commons SMARTboard is portable, therefor a data projector will be needed to project from the instructor's workstation or laptop onto the board. Ceiling mounted projectors cannot be used for this purpose. Circulating Equipment Request Form - reserve the SMART™board and data projector. "Clickers" or Classroom Response Systems, are a type of polling system seen on some game shows like “Who Wants to Be a Millionaire.” In an academic context, they have been used very successfully to engage students in large classes. A multiple-choice question is posed to the class, perhaps via an overhead projector, PowerPoint, or similar presentation method. The students “vote” on the correct answer using their clickers. After the voting is over, a histogram showing the number of students who chose each answer is shown to the class. At that point, the instructor can break the class into groups for discussion or simply go back to explain the material if he or she sees that the students are having a difficult time understanding the concept. Instructor hardware and software are bookable through the Education Commons Book Equipment form. The standard kit comes with 25 response units, but is expandable to 65. The Education Commons has available an AppleTV, which allows an instructor to wirelessly project their display to a classroom projector. Wireless display is automatically configured to send to the AppleTV if you use an iPad (iPod/iPhone) or Apple computer (MACbook). Wireless display of a PC laptop is possible by using 3rd party paid software. This technology is currently being run as a pilot project. Any instructors wishing to use this technology, Please Contact the Client Care Portal to book a consultation session at portal@oise.utoronto.ca.